Jean Lemoyne: My name is Jean Lemoyne. I live in Sainte-Anne-de-Sorel, and I've been hunting ducks for the past 24 years. Paul Messier: I'm Paul Messier from Sorel-Tracy. I've been hunting ducks for at least 25 years. Jean Lemoyne: Now we're in Baie de Lavallière, by Sainte-Anne-de-Sorel. This morning when we came to set up, we had a bit of a surprise: the marsh was frozen. We had to break the ice to get here. Paul Messier: This year, hunting season opened on September 22. The season usually starts during the weekend, on a Saturday, then runs until late December. That's the hunting season. 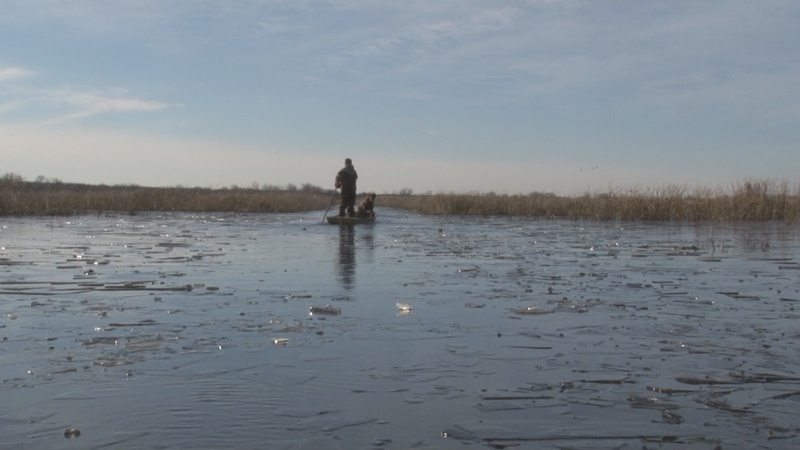 Jean Lemoyne: Ideally, you should pick a hunting site where there are already ducks. With the changing water levels, the ducks can move around. So we look for a spot where there are ducks; that tells us the habitat is suitable for them right now. Then, we just need to attract them with decoys. We can take six ducks per day, per permit. Before November 1, you can bag two Black Ducks. After November 1, you can take up to four. And you can always take only one Blue-Winged Teal. The type of ducks you find depends on where you are hunting. We usually hunt in the marsh, so we find Mallards, Black Ducks, and a few Teal. If we went out into the open water, on the lake, we'd find more diving ducks. Paul Messier: Bluebills, golden-eyes, stuff like that. Agricultural methods have changed, and there are fewer hayfields now. Fields are harvested earlier. Hayfields are mowed two or three times a year. Blue-Winged Teal have a lot of trouble because of that. That's how it is here, locally, but if you go to eastern Quebec, around Kamouraska and Île Verte, Blue-Winged Teal are more common because agricultural practices have changed less in those parts. Jean Lemoyne: What's changed, in my opinion, is the water levels. This year, there's almost no water. A lot of marshes couldn't be accessed in a small boat, because the water is too low. That means the habitat is changing, and there are fewer ducks in the places where we've always hunted. Paul Messier: It's a whole experience. Spending the day outside. Watching birds, because we're into birdwatching too. Shooting and bringing back a duck, well, that's almost optional. Hello, my name is André Côté. I'm 65 years old and I've been trapping since I was 18. Like many trappers in the province of Quebec, I would trap muskrats. We started with muskrats. In the Sorel area, the Sorel islands, the muskrat is probably the most sought-after, and most commonly trapped, fur-bearing animal. First, because it is abundant, and second, because it isn't technically difficult to trap. Trapping has changed a lot over the past 20 years, and fewer people are trapping. Why? It's because trapping doesn't pay the way it used to. They say it paid really well in the 1940s, 1950s, around the war, and especially before the war. Nearly every village in Quebec had a trapper. They would guard their secrets closely, because trapping was their livelihood. Today, everything is completely different. Even if you are a professional trapper and a member of the Quebec trappers' association, very few people make a living from trapping. Why do I love to trap? For me, it's a question of solitude. I feel good, I'm on my own and I get out into nature. According to the Catholic church, on Fridays people couldn't eat meat. But everything that came out of the water: fish, frogs, muskrats, ducks, geese—that wasn't considered meat. In the springtime, this gave people an excuse to eat meat on Fridays. So muskrat trapping was very popular for two reasons: to collect the fur, and for the meat. Various factors may have led to a decline in muskrat populations, which in turn discouraged trapping. One factor may have been that cattails are becoming less and less common in our marshes. This is because reeds are competing with cattails. Cattails are an ideal plant for muskrats. They eat it and also build their nests with it. Muskrats do not feed on reeds. They can use it to build their nests, but it doesn't have the same insulating properties. Another factor is that we may be burning the candle at both ends. For the past few years, muskrat trapping has been permitted in both spring and fall. Before, trapping was only allowed in spring. The reason for allowing trapping in the fall is scientifically sound: it depends on the year, but between 50% and 70% of the muskrat population in October and November will not survive the winter. It's like wasting furs. That's why they gave us permission to trap muskrat in the fall. But now, we trap them in the fall and we also trap them in the spring. In spring, we're trapping animals that managed to survive the winter. So that's our strongest breeding stock. Ecologically, we shouldn't trap them in the spring since we are trapping them in the fall. Let's take a look at the technical side. This muskrat was trapped yesterday; it is a fall muskrat. Muskrat fur needs to be completely dry. Before any fur-bearing animal is skinned, the fur needs to be completely dry. Once we take off the sin, we get this. This method is called case skinning. You can see that we keep the nose, the ears, and a bit of the tail, which is used to stretch the skin. The skin is degreased and stretched over a mold. Us trappers sell the dry skins. This is called a raw hide, which means that it has not been tanned. This skin is ready to be sold. Here's an example of a tanned hide. It's very different. Many people think that trappers sell tanned skins. Absolutely not! Tanning is a completely different trade, and we don't take care of that. Modern trappers catch muskrats as a hobby. Even though we're called professional trappers, because we do it for fun, we never get disappointed. If you try to make a specific amount of money from trapping, you might not end up so happy. Hello, my name is Jean Lemoyne. I'm getting ready to hunt deer with a bow. The first year I hunted this way was 1996. Since then, I've hunted in Baie de Lavallière every year, and always with a bow. Today is November 6. I usually get a deer during the first week of hunting season, which almost always starts in late September. But this year, I still haven't killed a deer, and it's November 6. That's why I'm going again. Deer-hunting with a bow involves attracting the deer to a specific place, since bows do not have a very long range. My hunting stand is 10 metres from my baiting site. I started placing apples here in July. I gathered apples from anywhere people didn't want them and placed them here. I kept bringing apples here until Hunting season opened, and I'm still doing it since I haven't been able to bag a deer yet. I try to get here around an hour and a half before the sun rises, so the magic can happen. I sit in my stand, and my smell fades. Eventually, I blend in with nature. It's like they can't tell that I'm there anymore. Then, I wait. Last year, three times in a row, at 6:05 a.m., I would check my watch every time, for three days in a row a Screech owl would come perch on one of my branches. There's a branch right next to my stand. Every day, for three days in a row, at 6:05, he would come. He was really on a schedule! He'd perch two feet away and look at me. He'd watch me for five or ten seconds. Then, he'd leave for his nesting box. I've got Screech-owl nesting boxes here. They were provided by the Société d'aménagement de la baie Lavallière. So the owl would fly down and into his nesting box. What I love most is being outside. I'm the type of person who is always outdoors. I'm passionate about many things, I love birds and trees. Because I come sit in my stand for one, two, even three hours each time I come, I get to combine everything. I see birds. I observe their behaviour. I hunt. That's what I love.